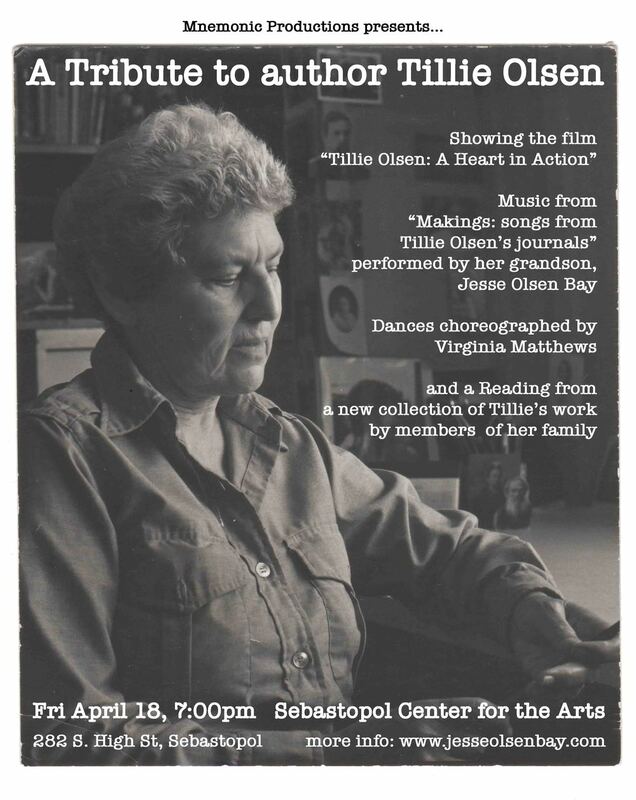 Please join us for this special free event, featuring music, dance, film, and reading from many of those who knew and loved Tillie. Composer Jesse Olsen Bay, Tillie's grandson, will perform excerpts from "Makings", a song cycle based on Tillie's journals. Choreographer Virginia Matthews has created dances to some of this music, and will be performing with her ensemble of dancers. Filmmaker Annie Hershey will appear in person to present her award-winning film "Tillie Olsen: A Heart in Action". And, members of Tillie's family will read from and speak about the newly published collection "Tell Me A Riddle, Requa I, and Other Works".